After spending six years in rural Éragny, Pissarro returned to Paris, where he painted several series of the grands boulevards. Surveying the view from his lodgings at the Grand Hôtel de Russie in early 1897, Pissarro marveled that he could "see down the whole length of the boulevards" with "almost a bird's-eye view of carriages, omnibuses, people, between big trees, big houses that have to be set straight." From February through April, he recorded - in two scenes of the boulevard des Italiens to the right, and fourteen of the boulevard Montmartre to the left - the spectacle of urban life as it unfolded below his window. 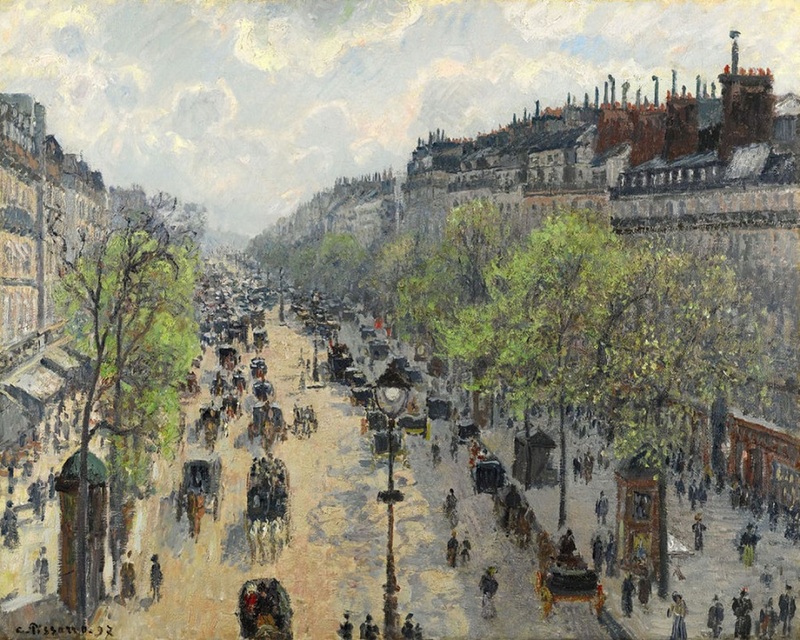 The remarkable scope and variety of the Boulevard Montmartre series reveals Pissarro's approach to the systematic exploration of a series of views of the same subject. Focused upon a single compositional device - the magnificent procession of the Boulevard Montmartre - the artist thoroughly investigated the different atmospheric conditions of the street. This variety is illustrated by two distinct determinations - the weather and the activity represented. Thus there are festive afternoons as well as comparatively tranquil ones, sparsely populated streets in winter and conversely busy scenes, as well as a view of the street at night. My Avenues are so clear that they would not suffer alongside the paintings of Puvis de Chavannes' "
Copyright © 2011-Present www.CamillePissarro.org. All Rights Reserved.